Ready to see what October’s box included? Let’s go ahead and reveal them, bar by bar. This was such a unique but also perfect bar for the season that we had to include it. We didn’t really know what to expect when sampling this one. And if we’re being perfectly honest here, we didn’t think it really tasted much like pumpkin. What did you think? Although that isn’t to say that this wasn’t an enjoyable bar! We enjoyed the dark chocolate with a sprinkling of salt, and we think it’s definitely a good autumn bar either way. All right, now let’s move on to the next one. This bar takes a very common flavor combination with chocolate (so they’re off to a good start) and combines it with another one to make it unique. That second flavor that they combined it with is the same as the last bar. A proven chocolate maker, Madecasse decided to play by the rulebook here. Take some high-quality, heirloom cocoa, build the bar all the way from the bean, toss in some almonds, and finish it with some sea salt. This bar is definitely the one that stands out from the other two. One, it’s white chocolate, not dark. Two, it did NOT contain sea salt as an inclusion. So what did it contain? Let’s see. 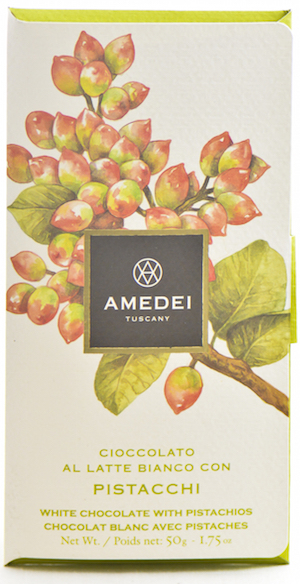 We’ve had Amedei in a couple other previous boxes and we like them because they’re a quirky but high-end Italian chocolate maker. The descriptions of their bars on the boxes are very exaggerated and romantic — and we love that. And that’s the October 2016 box! How did you like it? We’d love to hear! No Replies to "October 2016"